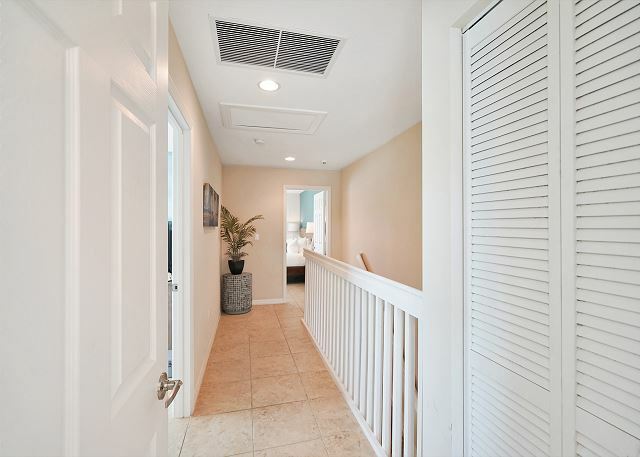 Santa Barbara - New Gated Townhome Pool, Hot Tub. Near Beaches. 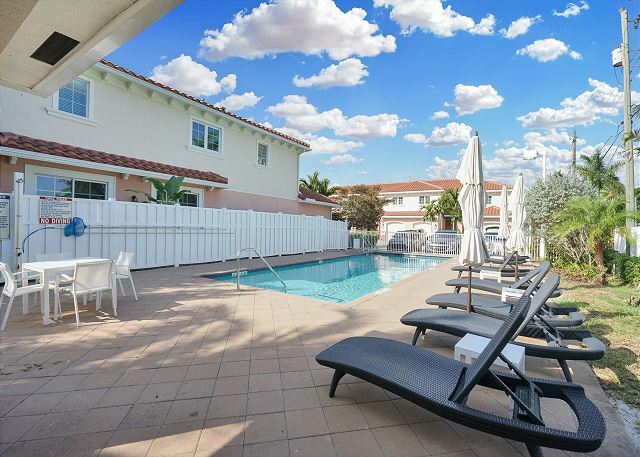 The large community pool is refreshing and perfect for small or large groups. 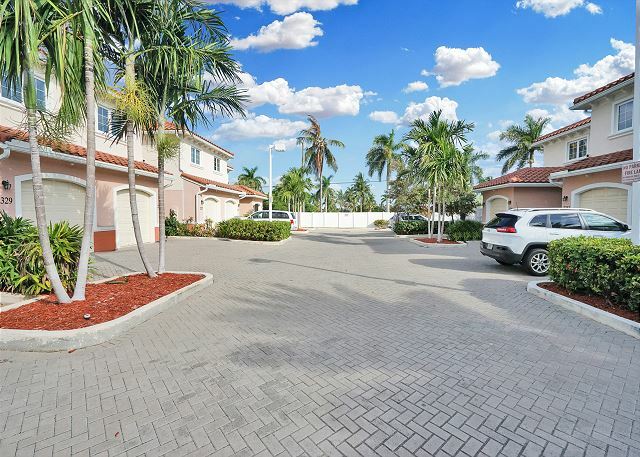 Guests can park in the single car garage or in the front driveway area. 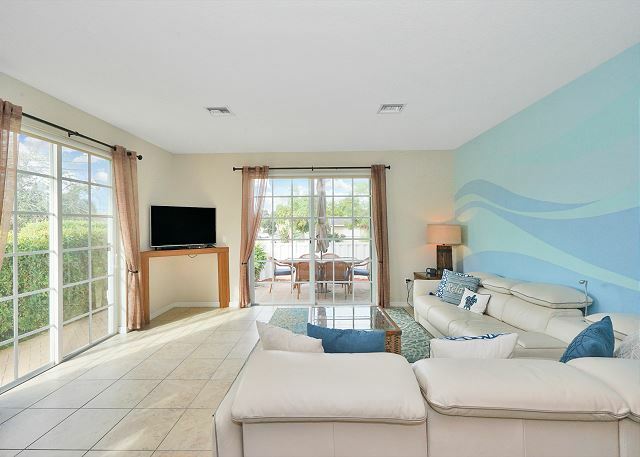 Lounge in the comfy living room area and admire the outside tropical landscaping. Cream leather sectional and pull-out couch can easily accommodate six people comfortably. A 32” LG plasma TV and queen-size sleeper in the living room is great to have for family movie night. 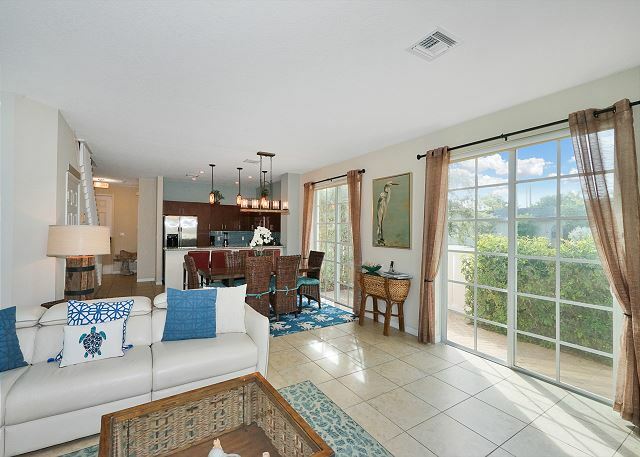 The sliding glass french doors allows the sunshine to pierce thru each morning. 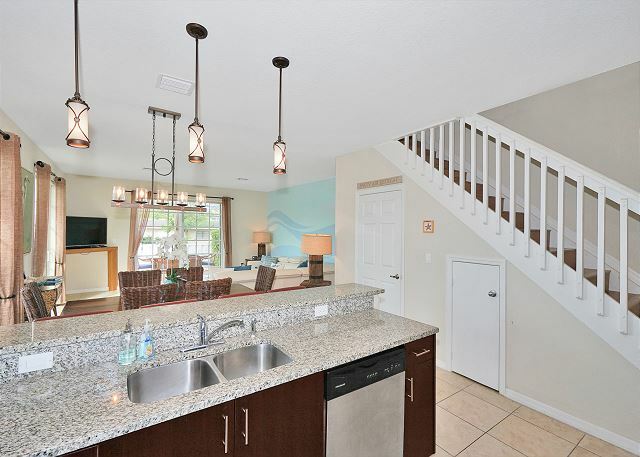 The living and dining areas are ideal for entertaining large or small groups. Beautiful wooden dining table is large enough for six people to enjoy a gourmet dinner. 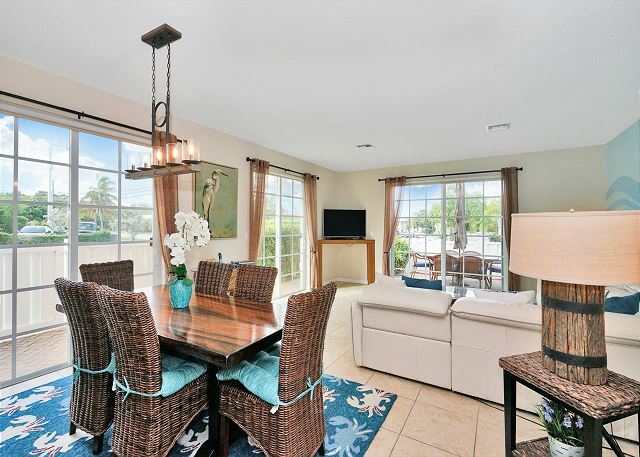 The "Tommy Bahama" style dining area is elegantly designed. 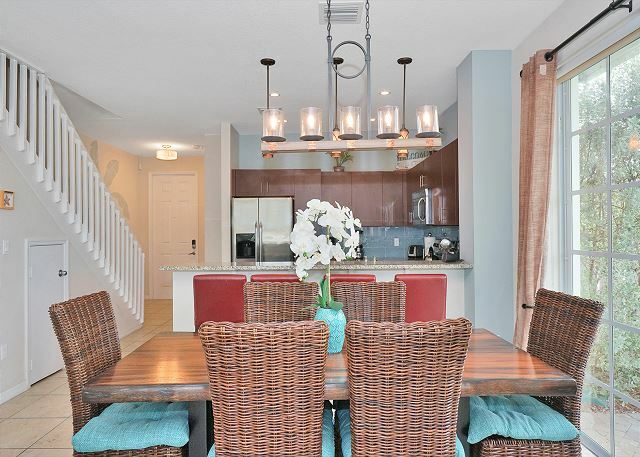 The dining, eat in and kitchen areas are perfect places to gather. Bar seating at the granite kitchen bar is convenient when eating on the run. 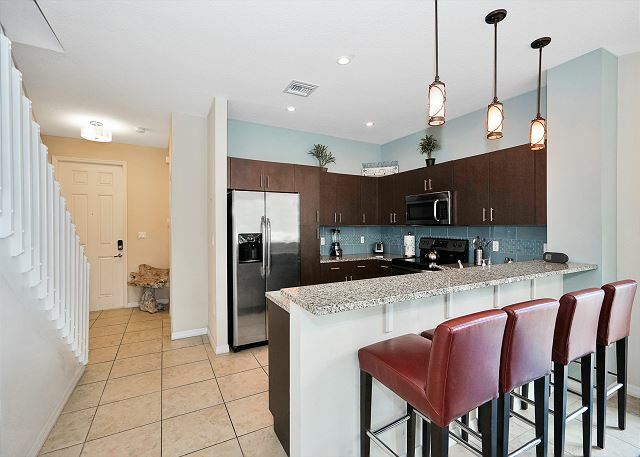 The modern granite counter tops and light fixtures add a touch of class in the kitchen. Tiled glass backsplash and top-of-the-line appliances are easy to use and add a modern look to the kitchen. 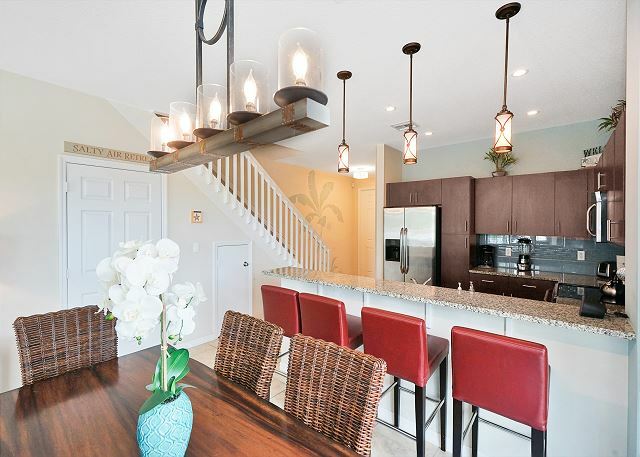 Modern accent lighting adds a touch of elegance in the kitchen. The dramatic staircase leads to the second floor where all the bedrooms are located. 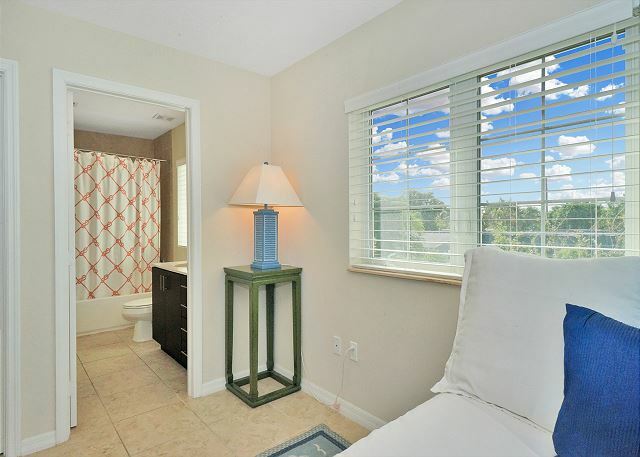 The double french doors in the master suite affords panoramic views of the lush landscaping. 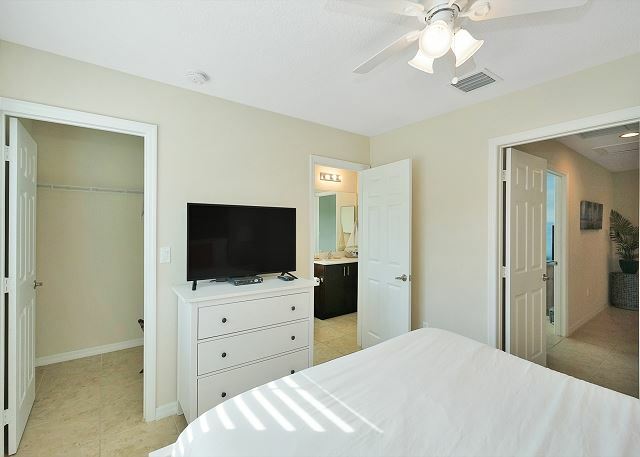 A 32” TV in the bright master suite is great for catching up on your favorite shows. 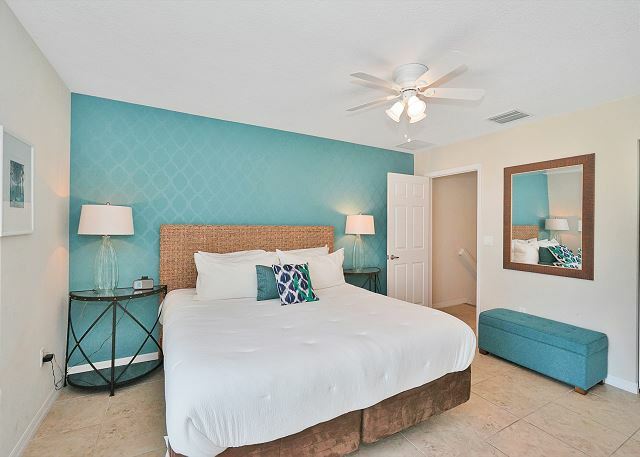 The master suite with king-size bed is cheerfully decorated with pretty blues and white. 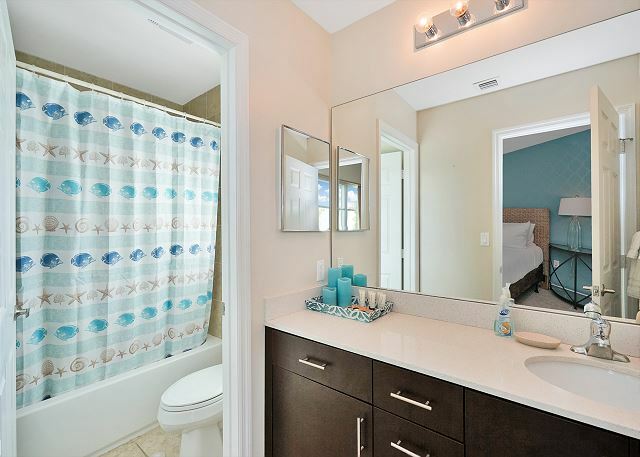 The en-suite master bathroom with shower/tub combo has fine wooden cabinetry. 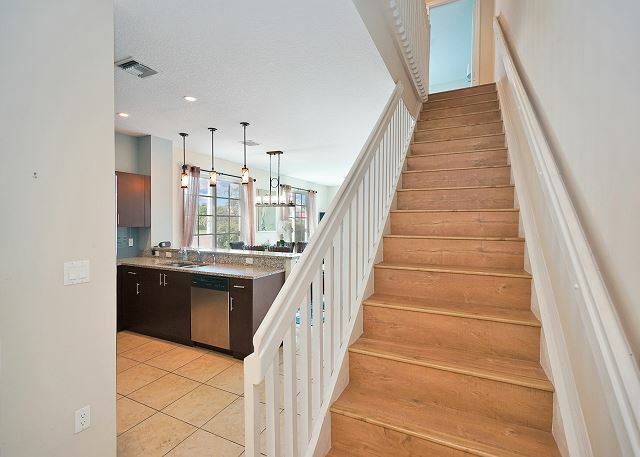 Wood railings are beautifully designed when walking from one room to another. Second bedroom with full-size bed and twin size pull out be. 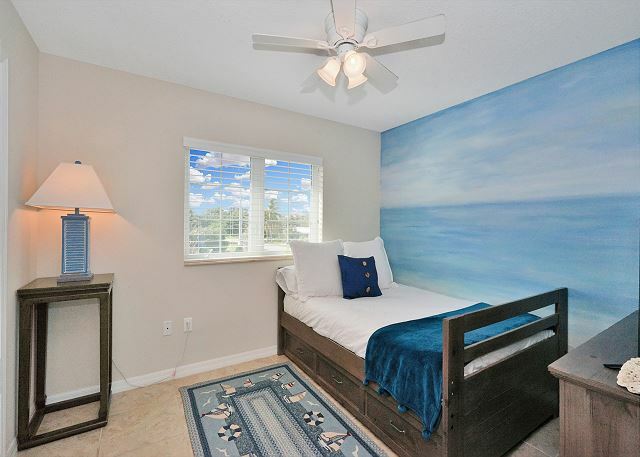 This room is decorated with ocean and water views. The second guest bedroom has it's own en-suite. The second bedroom en-suite offers a tub/shower combo. 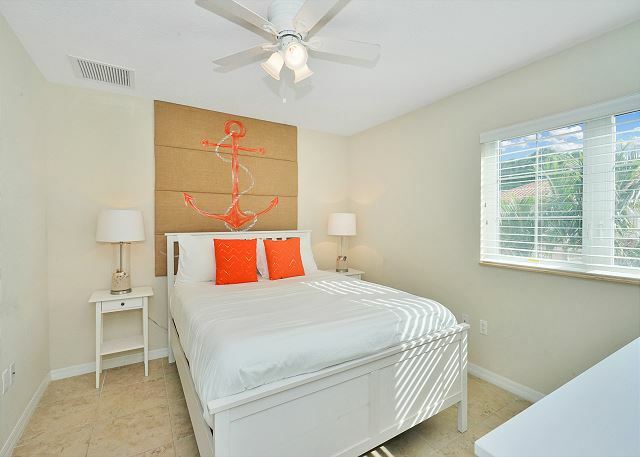 Anchors away with this third bedroom with queen-size bed. 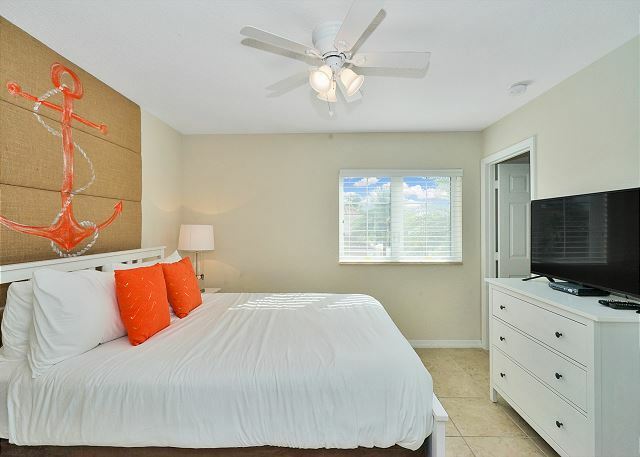 Bright and cheerful third bedroom with 32” TV offers rest and relaxation. 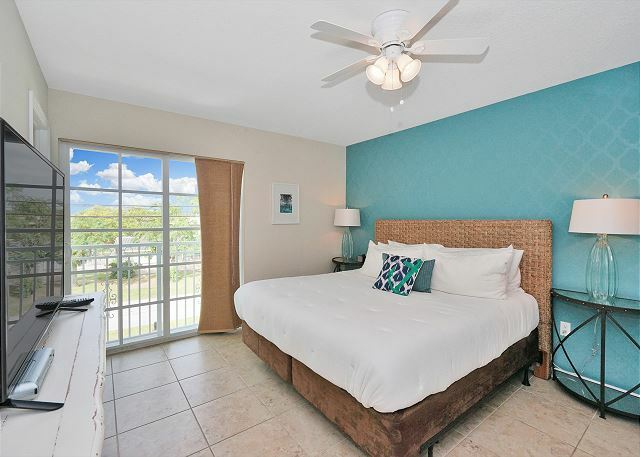 Third bedroom picture windows allow views of the lush tropical landscaping. Enjoy your large screen TV and Jack and Jill en-suite bathroom. 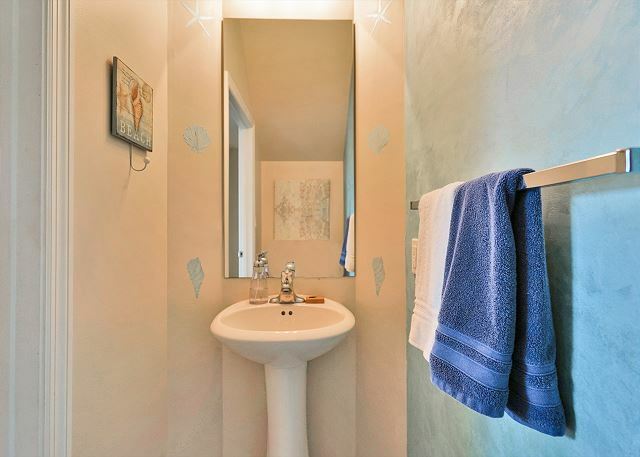 The half-bathroom is convenient for guests and visitors. 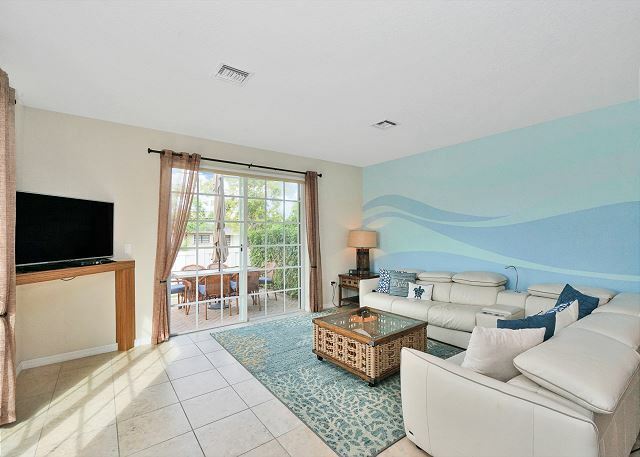 Sip your favorite tropical drink under the shady umbrella in your private courtyard. 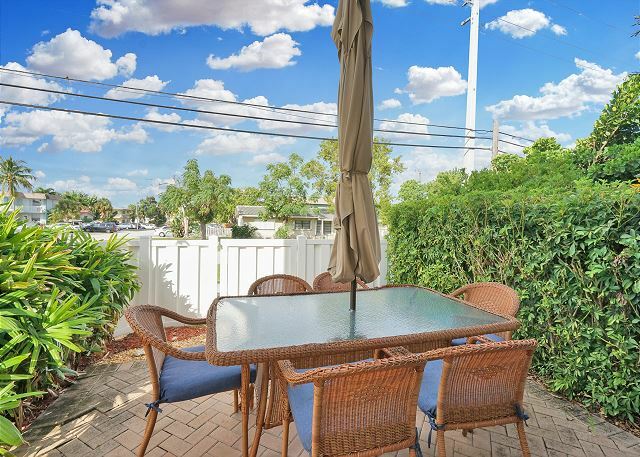 Dine al fresco on your private fenced-in courtyard area. 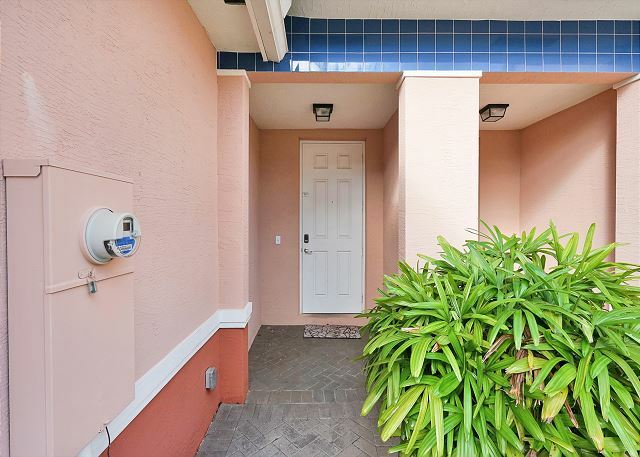 The front door is equipped with Affinity’s digital, key-less lock under the covered front porch. 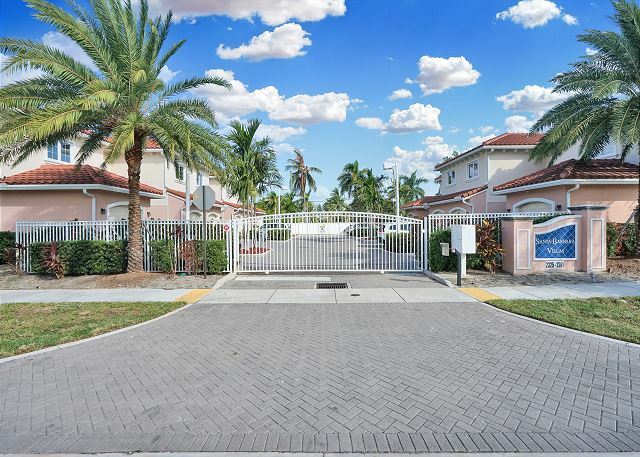 Feel safe and secure in the luxury gated community in the heart of Pompano Beach and close to beaches. The electronic gate will open upon entering the security code. There are plenty of loungers for those sun worshipers working on their tan. 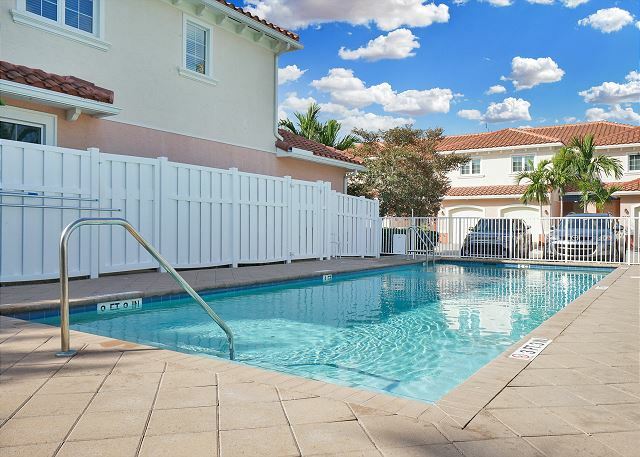 The community pool is ideal for swimming laps after a long day at the beach. 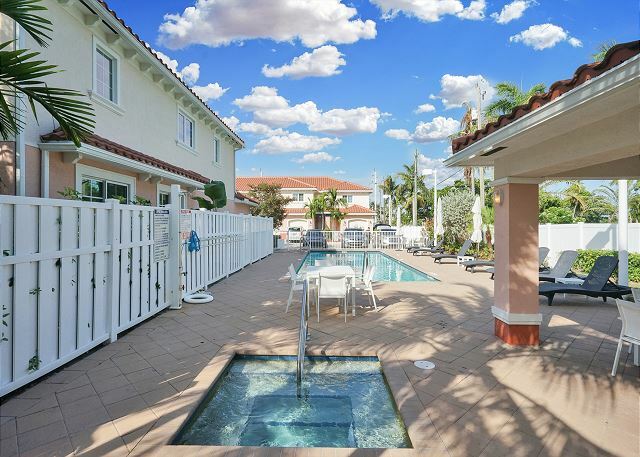 Gated community with a pool, deck, and hot tub for fun and relaxation. Accept nothing but the best. 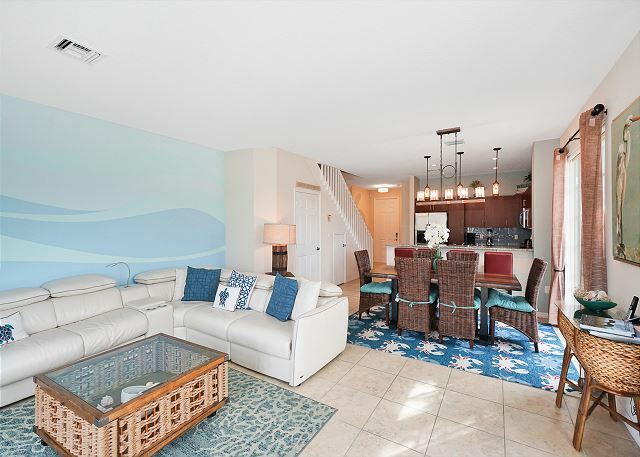 The light-filled living area has a 32” LG plasma TV and plush leather sectional couch and pull-out couch can easily accommodate six people comfortably. Share meals at the dining table for 6, with additional seating for 2 at the bar enjoy fresh fresh or a prime choice of meat at the local food market. Step into the spectacular chef’s kitchen. 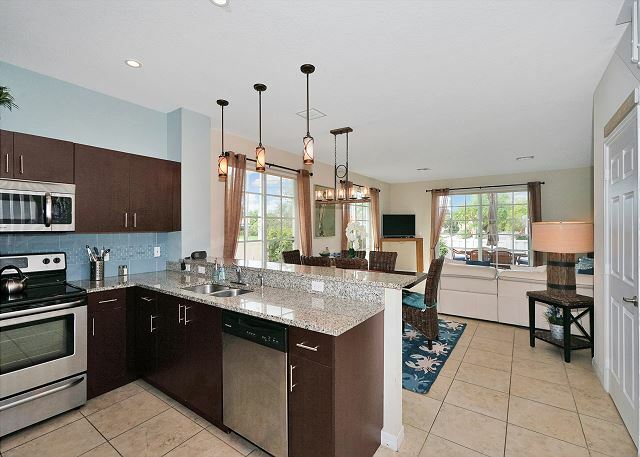 Granite countertops and an eye-catching blue tiled glass backsplash feature in this state-of-the-art space. 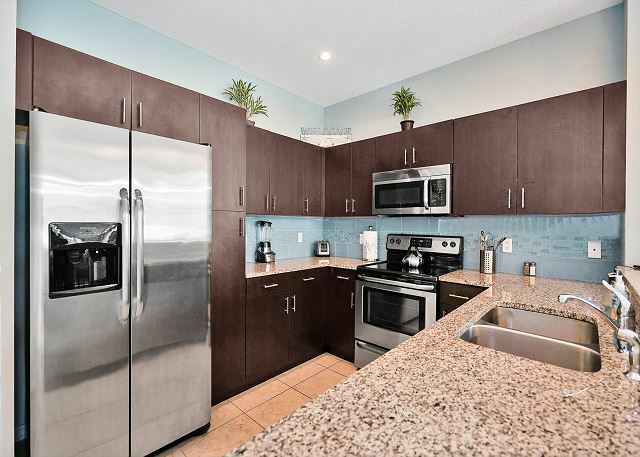 Stainless steel Frigidaire appliances and comprehensively stocked cupboards are at your beck and call. Upstairs, the master bedroom offers large windows that flood the space with light. 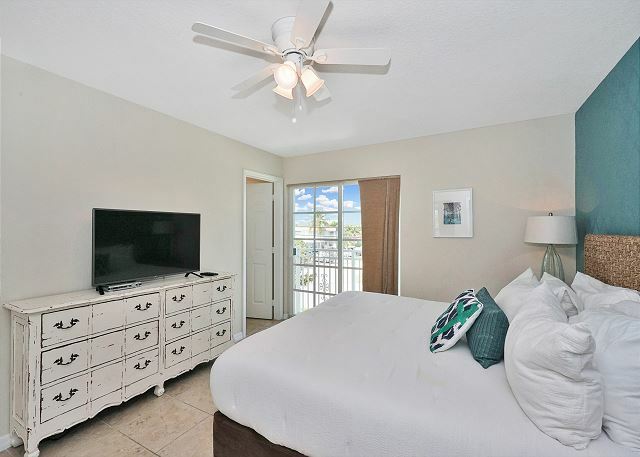 Snuggle down in the king bed and watch a late night show on the 32” TV. An ultra-sleek en-suite bathroom has shower/tub combo and fine finishes such as porcelain tile, granite countertops, and Italian fixtures. The 2nd guestroom has a full-size bed with a twin size pull out bed beneath, while the 3rd guestroom has a queen bed; both have 32” LG TVs. 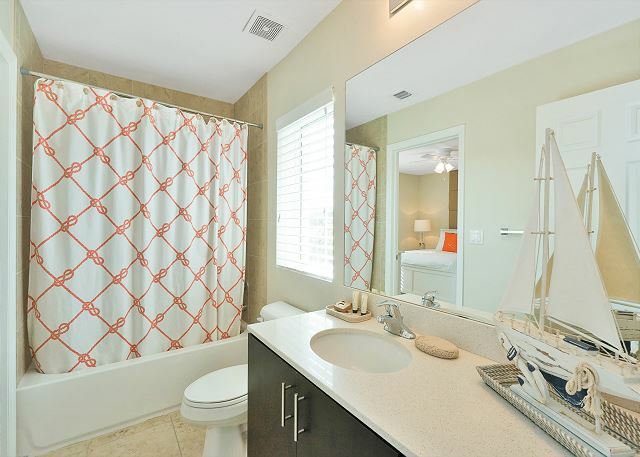 A shared Jack-and-Jill bathroom has a shower/tub combo for convenience. 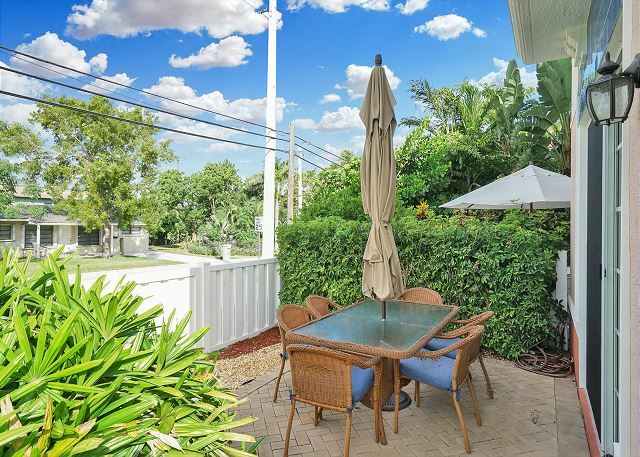 French doors lead to the tropical patio, where an outdoor wicker dining set is perfect for those al fresco evenings dining under the moon and stars. Keep your car cool and park in the garage, where you’ll also find the laundry facilities. A mile from the beach and a short stroll to Lake Santa Barbara means plenty of opportunity for aquatic fun. 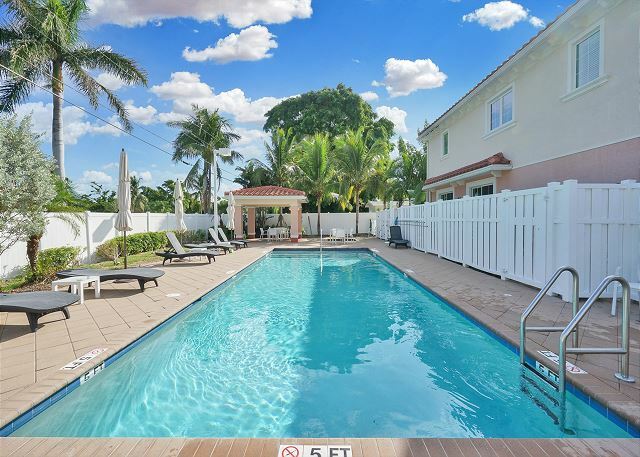 Pompano Beach stretches for miles in each direction, so rent some deck chairs, grab some ice cream, and lie back under the sun. 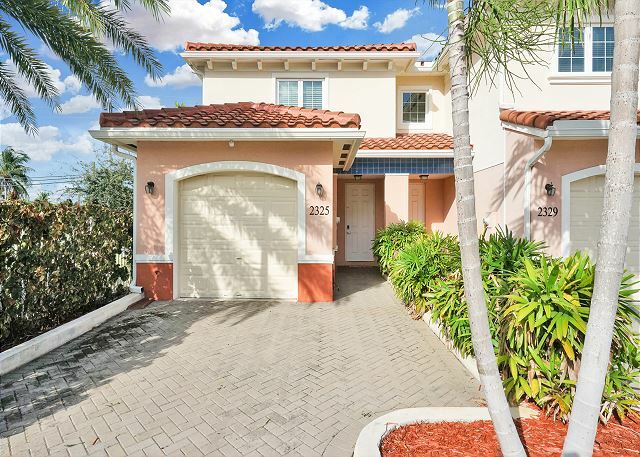 Las Olas is 15 minutes down the coast, with sparkling nightlife, art, and boutique shopping on offer. Shopping aficionados shouldn’t pass up Mizner Park, an elegant lifestyle center with top-rated eateries and a dazzling array of retail options. 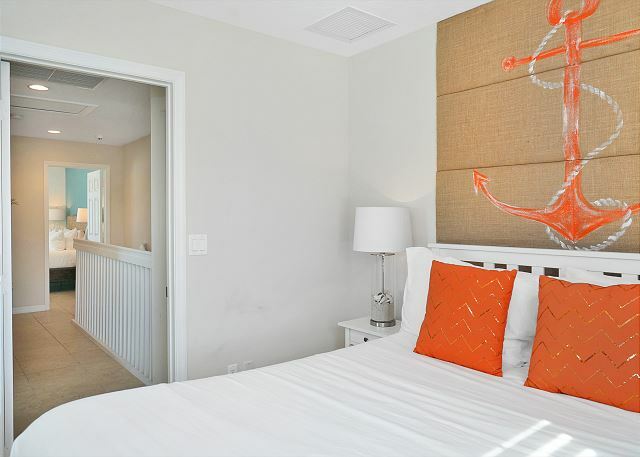 Whether you stroll to local cafés or explore further afield, this stylish new townhouse offers the chance to stretch out in indulgent surroundings or soak in the pool at the end of the day. An excellent place for a fun vacation. The place was really nice and in great condition. It was close to the grocery and an easy drive to the beach (or about a 20 minute walk). I would definitely recommend this location and rental agency! We forgot a coat when we left and they mailed it back right away!